2:1 Dear family, when I came to you, it wasn’t with carefully crafted speeches or polished pearls of wisdom. I came to tell you the secret of God’s plan. 2:2 I decided that while I was with you I would focus all of my attention on telling you about the crucified Jesus, the Messiah. 2:3 When I met you, I was so afraid that I was trembling. It left me feeling weak. 2:4 The words I spoke and the sermons I delivered weren’t especially compelling or loaded with scholarly insight.1 Instead, they demonstrated the Spirit’s power. 2:5 I spoke this way on purpose because I didn’t want your faith to depend on human philosophy and insights. I wanted your faith to grow out of God’s power. 2:6 I do, however, have wisdom to pass along to believers who are spiritually mature. But it’s not the kind of worldly wisdom that guides rulers who will one day be long gone. 2:7 What I’m talking about is the mysterious wisdom of God. Until now God had kept the wisdom hidden—this wisdom reserved for our benefit. 2:8 None of the leaders today understood God’s brand of wisdom. If they had, they wouldn’t have crucified our glorious leader. 2:10 But we know.3 God revealed it to us through his Spirit. The Spirit has access to the deep mysteries of God. 2:11 Who knows what a person is thinking? The only one who really knows is the spirit within that person. It’s much the same way with God. If we want to understand what God is thinking, we have to go to the Spirit. 2:12 It wasn’t the world’s spirit we were given. God sent us his Spirit. He did it because he wants us to understand what he is giving us. 2:13 When I talk about these spiritual matters, I’m not using words taught by scholars drawing from a library of human wisdom. I’m talking in a spiritual language, using spiritual words to express spiritual truth. 2:14 People outside the faith don’t get the things of God’s Spirit. They think all this spiritual stuff is foolish. The reason they don’t get any of this is because you have to be spiritually connected to understand what’s going on. Some Bible scholars speculate that Paul is saying that though humans can’t figure out the mysteries of God or gain access to his wisdom, the Spirit can reveal all of this to people of faith. This phrase is unclear in the original Greek. Various translations include “he himself is appraised by no one” (NASB); “they themselves cannot be evaluated by others” (NLT). Paul may be saying that because we are spiritually connected to Jesus, we can know some of what God is thinking and what he wants us to do. Paul said that his sermons were not “carefully crafted speeches or polished pearls of wisdom… Instead, they demonstrated the Spirit’s power” (2:1, 4). Which if any of the following options reflects what you believe many newcomers to the Bible would think after reading that? Paul is making an excuse for being a mediocre public speaker. Paul sounds like someone who is anti-intellectual and not particularly fond of scholarly pursuits. Paul was trying to say that directions about spiritual matters come from God’s Spirit, not from human understanding. Paul was saying that even if his sermons sounded simpleminded and unpolished, they nevertheless come from God’s Spirit. What do you make of Paul’s admission that when he first went to Corinth he was “so afraid that I was trembling. It left me feeling weak” (2:3)? 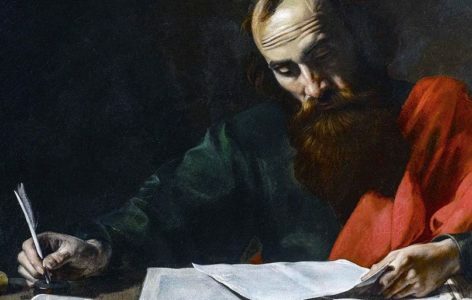 Paul said his sermons “weren’t especially compelling or loaded with scholarly insight… Because I didn’t want your faith to depend on human philosophy and insights. I wanted your faith to grow out of God’s power” (2:4-5). Yet Paul is speaking as a religious philosopher who is sharing his insights. How do you think he is different than any other religion scholar? Twice Paul quotes the Jewish Bible, which Christians usually call the Old Testament, to say it is impossible to know what is going on inside God’s mind (2:9, 16). Then Paul essentially says that through the Spirit we can now know what God is thinking. He says “We have the mind of Christ” (2:16). Really? LIFE APPLICATION. Paul said he had wisdom to pass along, but he implied that he reserved that wisdom for “believers who are spiritually mature” (2:6). What examples can you think of that might serve as spiritual snippets of wisdom appropriate for mature believers but perhaps not something that would be helpful to a new believer? LIFE APPLICATION. Paul says Christians “have the mind of Christ” (2:16) and that we can “understand what God is thinking” if we “go to the Spirit” (2:11). How does that work for you? If you need some direction from God, how do you get it?